Tower Investments CEO Bart Blatstein met again this week with Philadelphia's Civic Design Review Board to discuss the latest changes to his mixed-use proposal at Broad St. and Washington Ave., but for the second time the advisory group told him the project is in need of further revision. Blatstein had already tweaked the design amid vocal community resistance, removing an entire tower in the process, but the latest changes were minor: the addition of a staircase leading to the fourth-floor retail village and 60-foot westward shift of the single 32-story tower. 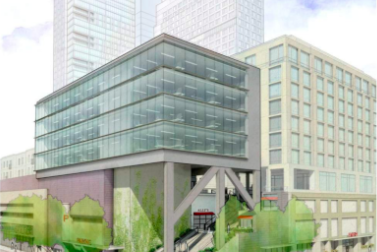 At Tuesday's meeting, Blatstein completed his presentation in under two minutes, according to PlanPhilly, and was told again that the glut of aboveground parking and "superblock" orientation were still problematic from a utility and navigation standpoint. Residents again challenged the height of the 32-story tower, which has not been altered to address multiple objections, Curbed Philly reports. Some likened the tower to a "wall" between South Philadelphia and Center City that would place an unsightly obstruction to the rest of the city. Blatstein, who is best known locally for building the Piazza in Northern Liberties and shopping centers on Columbus Avenue, was told by CDR Nancy Rogo-Trainer to "go back to the drawing board" and make more than the "perfunctory" changes presented in his latest plan. Elsewhere, Blatstein has remained active in Philadelphia and South Jersey. Last year, he purchased Atlantic City's shuttered Showboat Casino and opened up the Playground entertainment center at the Pier Shops at Caesars. In Philadelphia, he recently partnered with Cescaphe Event Group to pursue a conversion of the former PECO Delaware Station into a hotel and event space in Fishtown. The next step for the Broad and Washington project will be an April 27 hearing with the Zoning Board of Adjustment.